If you have read the website, you know I am a big fan of documentation. The documents you have for your car separate it from the clones, recreations and wannabees. 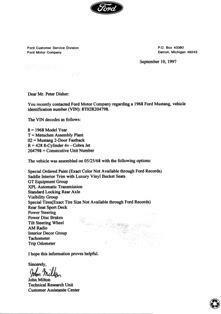 Documentation is what gives the car value and protects a valuable investment. Putting together a documentation book is not difficult. I recommend that you keep the original documents in a safe place. If you take your documents to a car show, guard them closely. I most cases, judges enjoy seeing supporting documentation. They do not like to look at endless pages of restoration pictures or receipts for parts, so you can leave those home. Let me show you what a documentation book looks like. This is the book for my own GT500KR. The excellent documentation was one of the reasons I originally purchased the car. I first saw # 3206 at a Shelby convention in 1991. "That's cute someone painted that KR orange", I thought. When I examined the car, I found the owner had placed a copy of the original build sheet on the dash. It did not list a color code. It did list a special paint code "WT 5185". When I questioned the Shelby Club, I found they had very little information on special paint cars. It didn't take me long to determine the original color was orange. The documents were the key. I like to organize my book chronologically. So, where was the car from 1968 until 1991? The owner had some information. 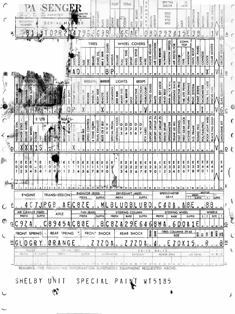 This information included the three previous owner's names, some correspondences and copies of old photographs. It was an excellent start. I am not aware of any one place where you can get ownership history for your car. It will require some detective work on your end. You should look for all the documents listed on this website. I recommend you work both backward and forward to fill in the gaps. Writing to the states where your car was registered can be helpful. In 1991, I wrote to four states and received documents from all of them. You can expect mixed results. You are also going to find some previous owners have passed away or are unavailable. You can appreciate now, why the best documented cars are the most valuable and sought after. Okay, I admit, that is a little excessive and you probably aren't going to find all that. But, you get the idea. All the documents are stored in a three ring binder. 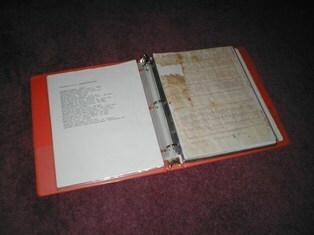 Each document has its own clear page protector. I don't recommend laminating or sealing originals. This is the build history "999" report. It is available from Ford for $17-46, depending on which report you want. It takes 4-6 weeks to receive. I have found these reports to be somewhat unreliable when it comes to options. The Ford Shop Gear number is 1-877-247-0195.